Sea Wolf II - blue dials? I was flipping through the catalogs the other day (a resource well worth the subscription, btw) and realized that just before Zodiac's final demise, the Sea Wolf II dive watch was shown availale in blue dials. This is the quartz SW successor, and has the SSW hands, with both hour and minute in silver outline instead of orange, and a saw tooth style bezel, but with a polished counter-bore / spot face. The rest of the case is bead blasted. 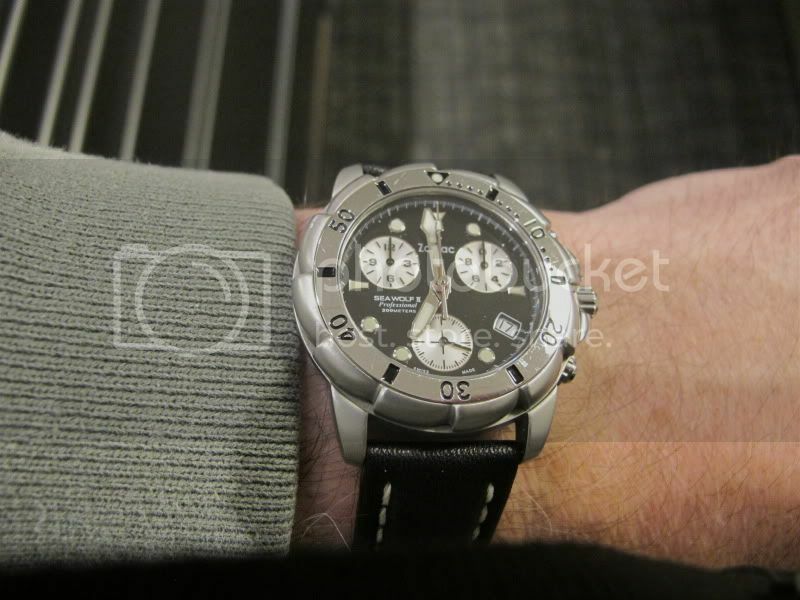 The only ones I ever remember seeing ANYwhere are a couple of black dial and white dial divers, and chronographs with white or black dials and same color sub-dials, or the white dial/blue sub-dial or black dial/silver (the one I have) sub-dial versions. I used to see these on ebay once in a blue moon, but nothing for a long time, and NEVER a blue dial, diver OR chronograph. So the question is, did pre-Fossil Zodiac really make any blue dial SW II divers, or do they only exist as images in their last catalogs, something planned never brought to fruition? Are there really any of those out there? Is this the bigfoot of the Zodiac world? If anyone also has a SW II, I'd love to see others, regardless if you know anything about the blue ones. Re: Sea Wolf II - blue dials? I assume zero replies means no one has any information at all, neither sightings nor rumors. I guess I'll keep my eyes open and searches running, but won't hold my breath. Sorry, I forgot to respond. Everything in the 2000 catalogs existed at that time. Cool! That means there is a chance to find one, though probably just a slim one. Thanks! Over the years I have seen more blue dial models than yours. I must just be looking in the wrong spots then, I can't remember seeing any. But you've held out hope, so I'll just refine my ebay searches and check Watchrecon more often.